I’m struck by the similarities with FlowChain, and as with FlowChain, it seems an exemplar of simplicity and flow. I also note the implicit “Advice Process” vibe, and the emphasis on “making the work visible” (Cf Personal Kanban). Scaling Agile is one of those oxymorons that has, nevertheless, consumed endless column-inches and hours of debate. I have no time for it. 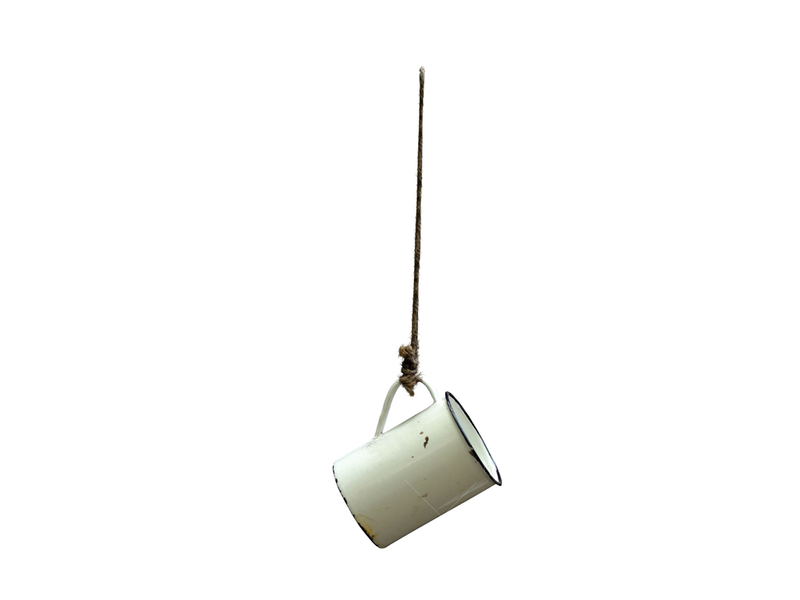 Agile was meant for development-in-the-small. For teams of five to seven people, give or take. Even at that “scale”, I have serious reservations about its efficacy and effectiveness. The idea of scaling it up to multiple dependent teams, or even to whole development departments or groups of hundreds or thousands of people, seems just crazy. Yes. There are organisations with hundreds or thousands of developers working on more or less dependent things. Huge systems. Ginormous products. And these organisations have problems. Boy, do they have problems. They’ve had the same kind of problems for decades now. Advances in tech and tools seems to have made little dent in those problems. Similarly, advances in methods and processes have barely scratched the surface. So there is a demand. A demand for something better. A demand for a packaged solution that can be simply (ha!) “installed” and run with. And the folks with the problems have money. Lots of money. Bags of moolah. No wonder it looks like an interesting problem to solve. The thing is, I don’t see many people, either on the demand or the supply side, that actually understand the nature of the problem. Absent an understanding of the problem, and given their desperation, the demand side will embrace any and all solutions that bear even a vague whiff of credibility. And the “Agile” label these days confers that smell. All product development is, in essence, an exercise in attending to folks’ needs. The more kinds of folks with needs, the more of their needs we bring into scope, and the quicker we want to see those needs met, the more people we might choose to commit. The question of agile (or not) is a huge irrelevance. Things like communications overheads, coordination, partitioning of needs, a regular cadence, flow, and effective use of resources (time, money, equipment) hold sway. TPDS had these issues sorted out (mostly) years ago with e.g. the Obeya or “big room” concept, set-based concurrent engineering, etc. I have suggested that something like FlowChain might afford an effective model for organising to meet folks’ needs at scale. I have yet to hear anyone suggest why this model is flawed. Until that day, I will continue to invite you to consider its merits. The demand side continues to have needs that are not being well-met (due to e.g. a host of pathological beliefs). The supply side has needs that are being more-or-less well met by selling solutions largely disconnected from the real problem. Scaling agile seems to me a very one-sided, cynical and exploitative bargain. You may have noticed that I write regularly about the different mindsets that explain the relative effectiveness of the organisations we work for and with. Things like Theory-X (strong in the Ad-hoc and Analytic mindsets) vs Theory-Y (Synergistic and Chaordic mindsets), and organisations-as-machines vs organisations as social/biological/complex adaptive systems. One difference I have not touched on much is the part that emergence has to play in the effective organisation. Does Your Organisation Embrace or Ignore Gall’s Law? Ad-hoc and Analytic minded organisations generally believe that systems are best designed, up front, with acts of conscious will and intent. Be they organisational structure, policies, products or a myriad of other systems upon which an organisation depends. Synergistic organisations learn, by degrees, that John Gall nailed it – complex systems that work require evolution from simple systems that work. For effective (working) organisations, we need to embrace emergence. We need to allow our systems – and our thinking – to evolve to the point where emergence is working for us. This is hard. Emergence seems messy. Allowing things to take their own course is hard for folks who seek certainty and control as means to getting their needs met. It can often feel like a crowd of people trampling over your nice, neat, manicured lawns. But the properties of beauty and simplicity can emerge more or less unbidden, too. Whilst we opposed emergence, we lock ourselves into relatively ineffective ways of thinking, and thus, of working. Only when we embrace and encourage emergence, do we open the door to more effective ways of thinking and working. Would you be willing to consider, and share, where your organisation is at regarding the role of emergence? When I conceived of FlowChain, some six years ago now, my immediate context was development shops with their own in-house developers, and other supporting staff. But it strikes me that with just a few adjustments, it’s also suitable for organisations that sub-contract out most or all of their development projects to third parties. How will the third parties be paid? Some UK government functions use function points as a measure of “work done”, with a set price for each function point “delivered”. See: Output-based contracts. I can imagine other contractual arrangements, too. How will the third parties’ staff integrate or form healthy relationships with the in-house commissioning staff (a.k.a. product owners)? Will there be shared spaces? Regular visits to and fro? Some more technical forms of communication (Twitter, chat, video conferencing, etc.)? Remember, each backlog item is sized for two to three people working together for two to three days. Third parties remain free to pull items from the backlog as they see fit (just as with in-house FlowChain), and use their own tools, languages, etc.. I foresee some advantages in having a common code repository, coding and other standards, agree requirements around test suites, and so on. Maybe the organisation contracting the third parties has its own Ops department. In this case the interface between development (teams, third parties) and Ops would probable best be standardised and agreed (like an API). If the third parties have their own Ops folks, then they can do DevOps in their own space and time, and serve the “production” services – or even micro-services – they each operate, directly to users. 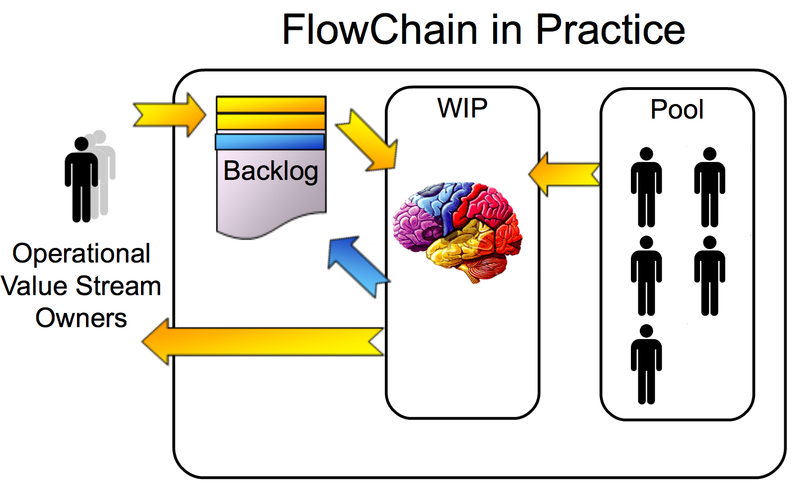 For clarity, this variant of Flowchain retains the enterprise-wide backlog, with user stories, improvement stories, etc. being prioritised by some black box (or white box) prioritisation algorithm, committee, manager, or whatever. The only real change is in how the Pool is constituted. Note: I see no particular reason why the general FlowChain principle of “ANY unassigned development folks from the Pool can coalesce around each new top backlog item” cannot stand, here. There may even be emergent advantages in having e.g. developers from different third parties coming together to collaborate on specific backlog items. How weird would that be? Again, policy would guide folks’ actions here. Who would “manage” the backlog? This could be done by a small in-house staff, or itself subcontracted out to one or more third parties. Note: the backlog in FlowChain is largely self-managing, in any case, given an effective prioritisation algorithm or approach. Flow (of e.g. software into the hands of those whose needs are being attended to) remains the key objective of the whole approach. For organisations without an in-house development capability, this approach provides a simple(r) path to establishing and growing an in-house development capability. In-house developers can be added, one by one, as and when circumstances (budgets, priorities, etc) allow. These new folks can work alongside – and learn from – third-party staff already used to Pool working, and the balance between in-house and out-of-house staff, skill sets, etc. adjusted dynamically as needs dictate. The key drawback I foresee is in the matter of dev-ops integration (DevOps). This could prove more difficult, in the case where developers, etc. are out-of-house and Ops in-house. This seems a special case of the issues of outsourcing and offshoring, generally. But I’m sure a bunch of smart developers and smart ops can work this out, especially with some help and guidance. Essentially, every approach to software and product development is about a flow of things whereby a development team, group or organisation attempts to satisfy some selection of folks’ unmet needs. In batch-and-queue (e.g. Waterfall, etc.) approaches, needs are batched-up into large batches, and flow (not very effectively) through a sequence of queues. Each batch (in the pathological case, only one ) eventually gets dropped onto those assumed to have said needs, and that’s about it. In iterative (e.g. Scrum, Kanban, etc.) approaches, needs are batched up into many, relatively smaller, batches, and flow (rather more effectively) through a sequence of queues (at its simplest, e.g. Backlog, Doing, Done). Each batch gets dropped onto the folks assumed to have said needs, and these folks get the chance to say if their needs have been met well enough, or not. When budgets and timescales allow, a later iteration can then have another go at better meeting the poorly-met needs, along with including any other priority needs that might have emerged along the way. Different approaches differentiate themselves on e.g. batch sizes, selecting of the kinds of folks whose needs will be attended to, cadence and strategies. Who gets to specify how any particular “value” is measured or quantified (most often folks ill-equippped to do so). The whole notion of “value” (often overlooked, often misunderstood). Valeu is too often though of in simple economic or financial terms. Human beings perceive value differently, and much more richly (e.g. emotionally). How can we tell when we’ve delivered “value”? So, I propose that needs trump value. And therefore, that when focussing on flow, it’s more useful – and effective – to focus on the flow of needs. The above diagram shows a system boundary – this could be the whole organisation, the development organisation, or just one development team. Bundles of external needs flow into the system, and merge with other bundles of needs coming from inside the system. These bundles pass though various stages (and queues) where “development” strategies are uses in moving the bundles from stage to stage, and from queue to queue. Ultimately, candidates (things we hope will meet the needs that entered the pipeline) flow back to external parties, and also to internal stakeholders, such as the developers themselves. 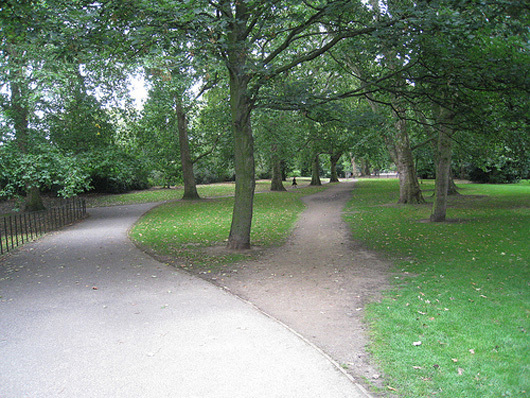 This perspective allows for the simple integration of dealing with impediments. Things that are impeding e.g. flow or the outflow of effective candidates may themselves be needs. And may enter the pipeline much as any other needs. Of course, there may be some( or many) such impediments than no one has any need of dealing with. These may be filed or ignored. Whilst FlowChain was conceived to be awesomely effective at handling bundles of e.g. User Stories, Use Cases, Improvement Stories, etc., it can very easily embrace the unit of flow being bundles of needs, or – in the single-piece-continuous-flow scenario – individual needs. From the diagram, you may begin to see how we might simply make the flow of needs visible, should we so choose. And personally, I’d like to make visible the ultimate fate of the candidates too, with a little expansion of the scope of the diagram. And the queues (particularly the first) can serve as a convenient means to limit Work In Progress (a.k.a. Needs in Progress). It may not be immediately obvious, but the NeedsFlow perspective implicitly removes the need for projects. NeedsFlow decouples development (flow) from products and product lines (each of which meet a more or less related collection of needs).